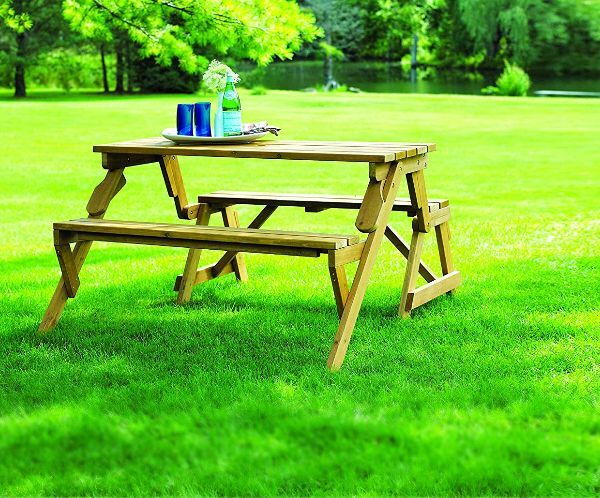 Summer is here and nothing can make your days more perfect than a garden picnic bench table. Have you been planning to host a grill party at home but having issues on how you will accommodate your guests outside? Maybe, you have been wanting to take your family bonding to a whole new level by arranging lunch and dinner outside? Whatever reason you may have, a garden picnic bench table will surely help you achieve your summer and family goals. 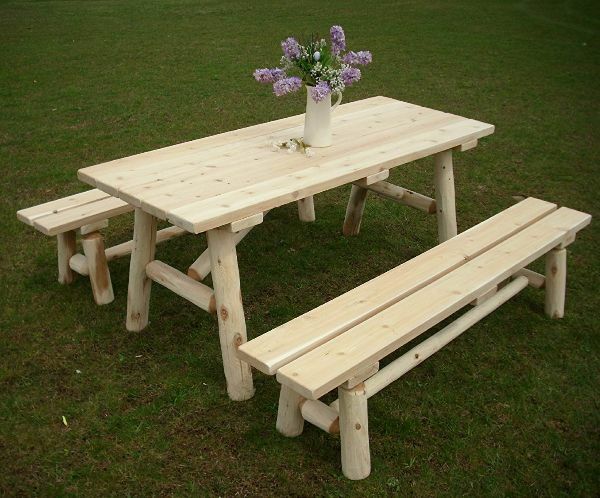 Here we have created a collection of a durable outdoor garden picnic table and benches for you. From small tables for kids to large family picnic tables, we got you covered. We also featured amazing designs from traditional tables to contemporary modern table designs. Check out these options and get yours now! 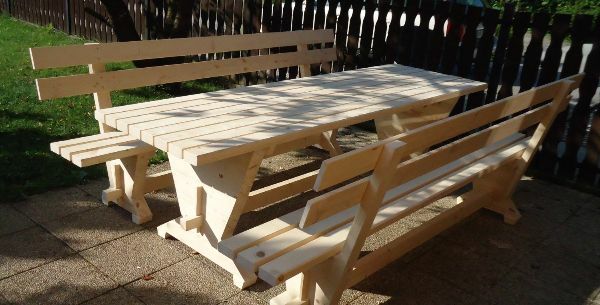 This sturdy picnic bench can be made from Cedar. You can customize based on your preferences. If you choose the picnic bench made with Cedar, there will be a clear coat applied to its finish. If you choose the picnic bench made of Cedar, it will be stained. Both are known to stand the test of time when placed outdoors so they will be perfect for your backyard and patio. They look amazing indoors too. You can even place it in your dining room. 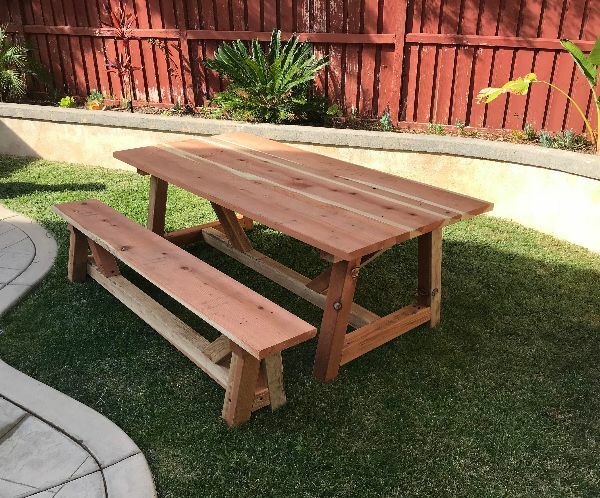 A modest picnic bench for small spaces and backyards; This lovely garden picnic bench is made of redwood. Its size is a bit little but it is built to last for years. If you have kids at home, this bench can be their playground. Above all, the material redwood is low maintenance and is naturally resistive to insects and rotting. Meanwhile, this laminated garden picnic bench is built from high-quality wood. 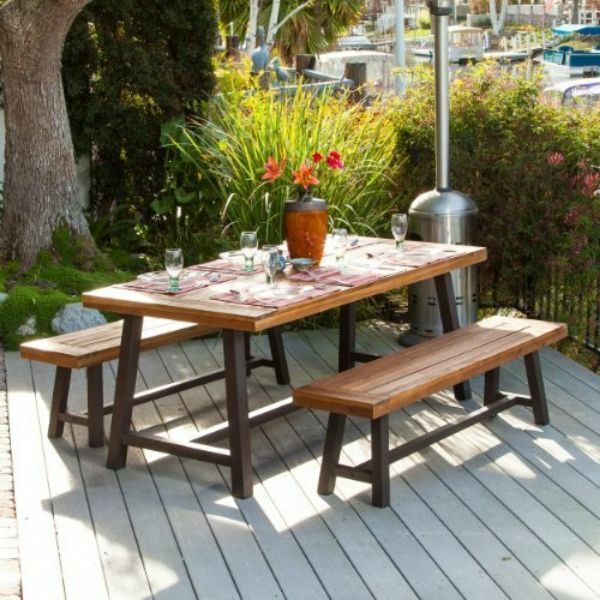 It is a picnic table and bench which is a terrific addition to any garden. Let your kids eat, study, and play on this picnic table and they will surely love it. 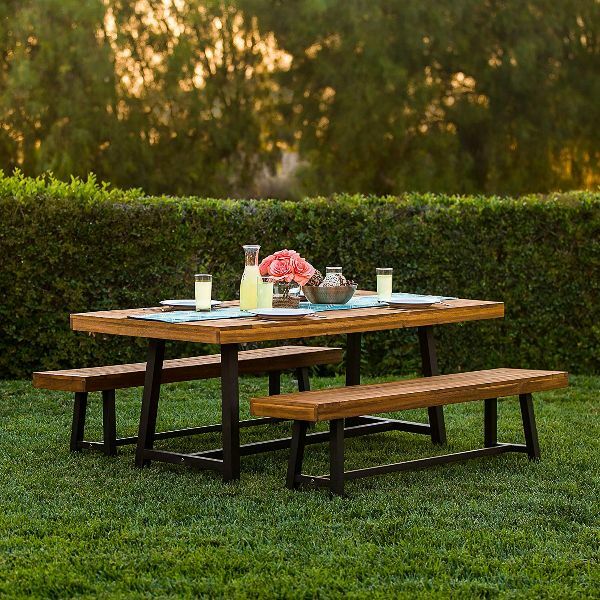 This handmade garden picnic bench is made of 100% real Western Red Cedar in Texas. It comes with two small benches good for 2 persons. The benches and table are highly durable and sturdy. They can hold a lot of weight and does not tip over. The bench is designed to avoid splinters. The top of the table and benches are smooth for comfortable sitting. If you do not like the typical garden bench where your legs are prone to bumping, then this bench is for you. You can position the bench anywhere you like which means more leg room for everyone! Not only is this table comfortable, but it also ages beautifully. Next on our list is a nice picnic bench that also includes a cooler for your ice and drinks. You can sit comfortably with this backed style picnic table set while savoring your ice cold soda or beer. If you have other customizations in mind, you can also request a custom order. If you are planning a cozy outdoor dinner with friends, the Acacia Wood Dark Brown Picnic Set is incredibly suitable to host your activity. Whether you opt for a sit-down or buffet style dining, this picnic set can adjust to any of your plans. Its dark brown finish gives it a simple, classy, and neat style. 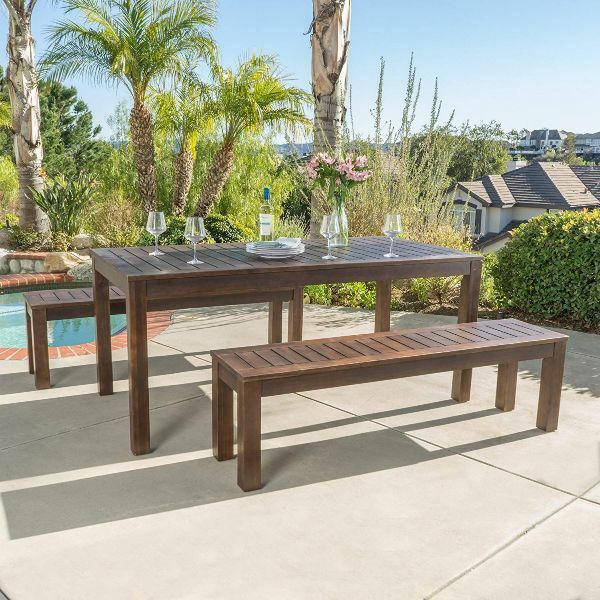 In this case, the Bowman Outdoor Picnic Bench and Table Set are built from Acacia wood and iron. It is suitable for indoor and outdoor use. Use this picnic table on a hot summer day while grilling with your family and friends! A simple garden full of green plants and brick would look like your dream garden with a white garden picnic bench. This table features high-quality Acacia wood that is durable and long-lasting. 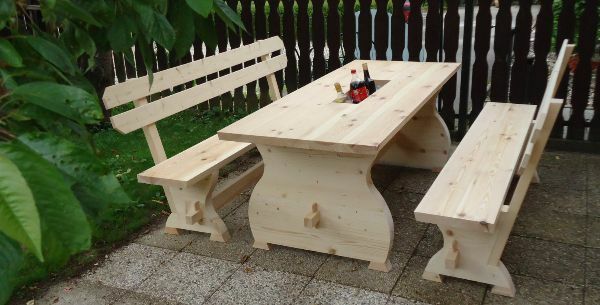 Not only is this picnic bench elegant, but it is also quick to assemble. A perfect table for kids and kids at heart; this will be a perfect addition to your garden or tree house. There will be no reason for you to not enjoy outdoor play time with your kids. With its bright rainbow color, kids will surely have a great time playing or eating their snacks. Do you have a limited garden area? A small garden space is not a problem with this Interchangeable Picnic Bench and Table. 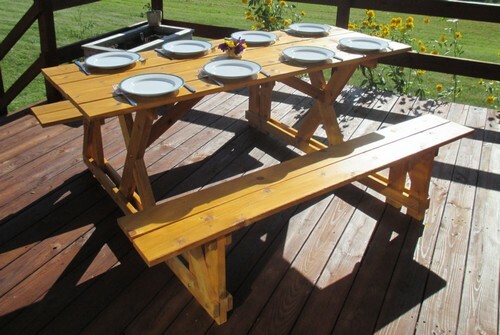 You can readily transform it into a picnic table to a garden bench and vice-versa. 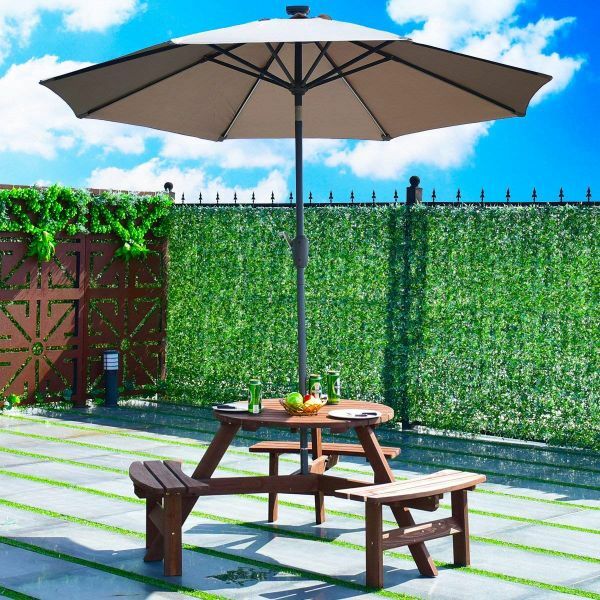 It even has an umbrella hole which can accommodate any common sized patio umbrella. 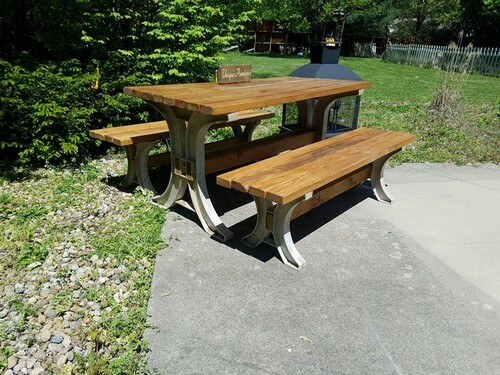 Are you tired of having the usual picnic tables with benches? 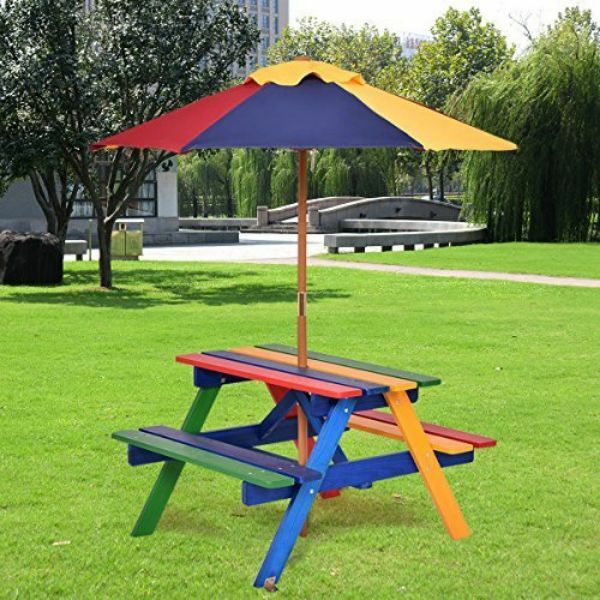 If you are, then why don’t you try this round 6 Person Wooden Picnic Bench and Table Set. This table is made of solid fir wood. 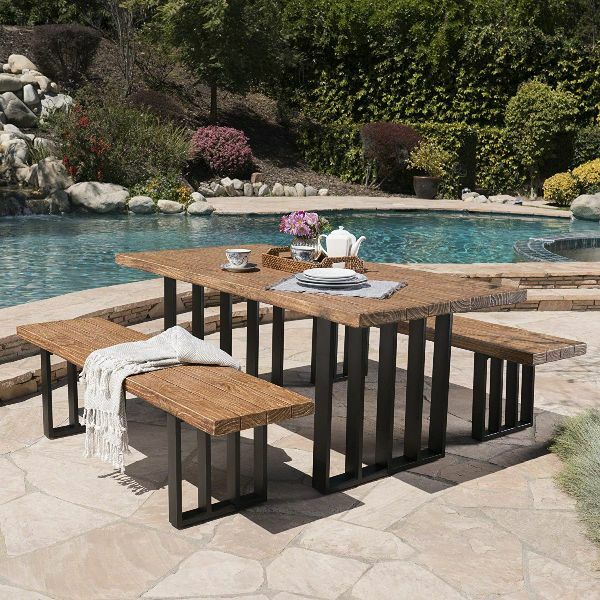 It is simple to assemble and perfect for wooden patios and rustic gardens! 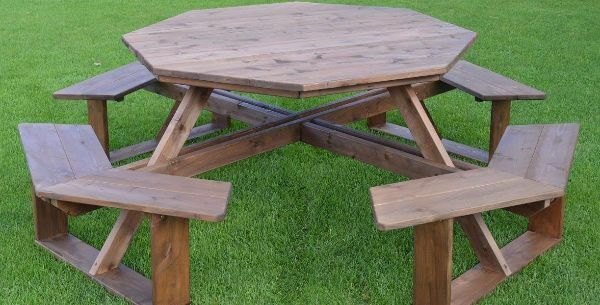 Another uniquely designed picnic table for your garden; this table follows an octagon design. It is walk-in accessible which means that those who will seat will not need to slide or step over a bench. With its great look, it is perfect for a whole family. 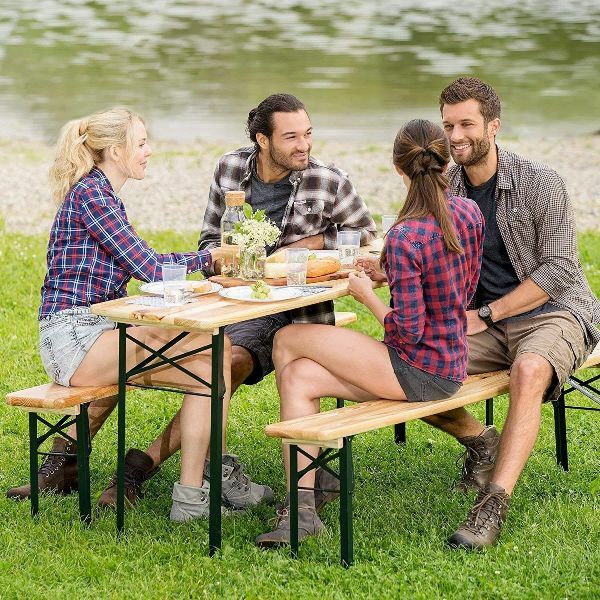 A trip to the park will be incomplete without this Outdoor Portable Folding Picnic Table Set. It comes in a foldable design, thus making it simple for you to readily store or carry. Besides that, this product does not require any assembly and only has a basic set-up and take-down system. Otherwise, spend your Sunday with family and loved ones by eating brunch in this Rustic Wood Picnic Style Table Set. This rectangular set can accommodate 6 people. You can absolutely place this in your garden, patio, or backyard since it is weather resistant. Isn’t this White Cedar Log Picnic Table with Detached Bench a charming addition to your garden or backyard? Take note that this product is not from a DIY kit and is completely made to order. Indeed, having this set outdoor is ideal since Cedar is naturally tolerant to rot, insects, and weather impact. Last but not the least, we have the Natural Oak Finish Picnic Set. 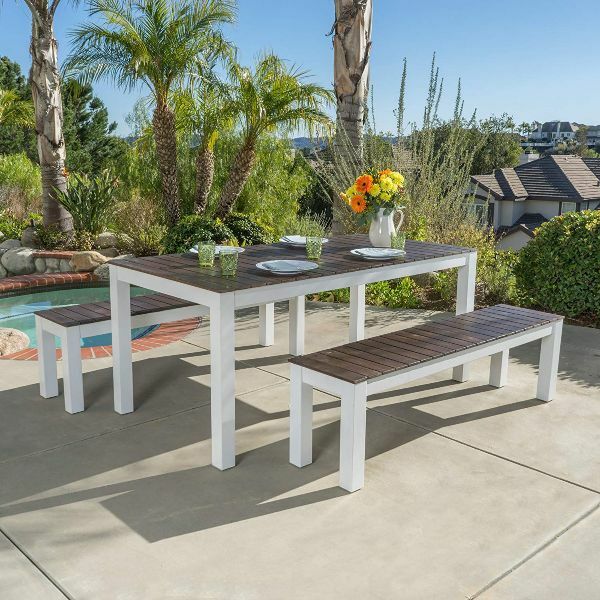 Although it gives off the traditional picnic table style yet this set is built from modern materials. In purchasing this picnic bench set it includes weather resistant covers to protect it when not in use. The wide variety of designs for garden picnic bench table featured here should help you and your family enjoy outdoor dining. Start enjoying the sun with your kids as they play in your garden and use the table as their playground.